When I suggested this Chocolate Meringue Cake to a friend for a recent dinner get-together, the response was an emphatic “woahh…let’s do that!” – absolutely no doubt. Just look at the chocolate-y, sugary goodness! 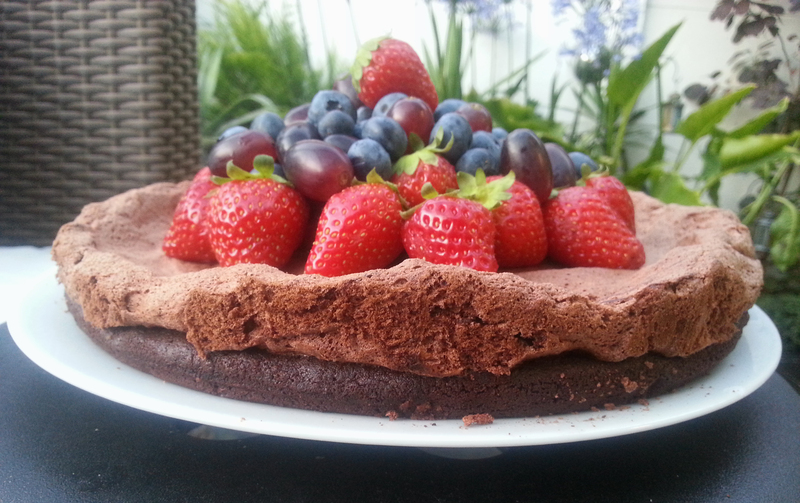 The meringue was not too sweet, but it added a nice crunchy texture to the cake, and the berries cannot be forgone, since it goes well with the chocolate and cuts through the sweetness. I overbaked the cake base, since I used a larger pan. I would reduce the cooking time to 15 minutes, since I found that the meringue took at least 30 minutes to harden. I would suggest serving this warm, and place berries on the cake just before serving otherwise the meringue will soften. 1. Preheat the oven to 325F. Lightly grease a springform 8 inch pan (I used 9 inch, but smaller is better for height and texture of cake), place some parchment paper on the bottom and set aside. 2. Place butter and chocolate in a small pot over low heat and warm enough to melt them. Turn off the heat let it stand for a bit. 3. In a large bowl place the eggs, egg yolks, brown sugar, and vanilla and mix or whisk for about 5 minutes until the mixture is pale and has doubled in size (it should look really frothy and thicker). Add the chocolate/butter melted mixture, flour, baking powder, and almond meal and gently fold until combined. Place batter in the cake tin and bake for about 30 min JUST until set – DO NOT COOK FULLY! We need to add the meringue so it should 3/4 done (it’s ok if it’s looks a bit “raw” still). Remove from the oven, set aside. Start the meringue as soon as you take the cake out of the oven. Not before, as meringue can’t sit. 2. Place egg whites in a CLEAN bowl (no grease, no water) and beat them to soft peaks. Slowly add the sugar (about 1 tablespoon at at time). When you’re done with the sugar, add the vinegar and beat until meringue is nice and glossy. Add the cornstarch and cocoa and gently fold. Finally, slowly drizzle the melted chocolate and place the whole thing on top of the cake. Don’t mix the chocolate as you want natural swirls to happen! 3. Place the cake with the meringue back in the oven and bake for about 20 minutes or until the meringue feels dry. Remove from the oven when done and let is stand outside for a bit. 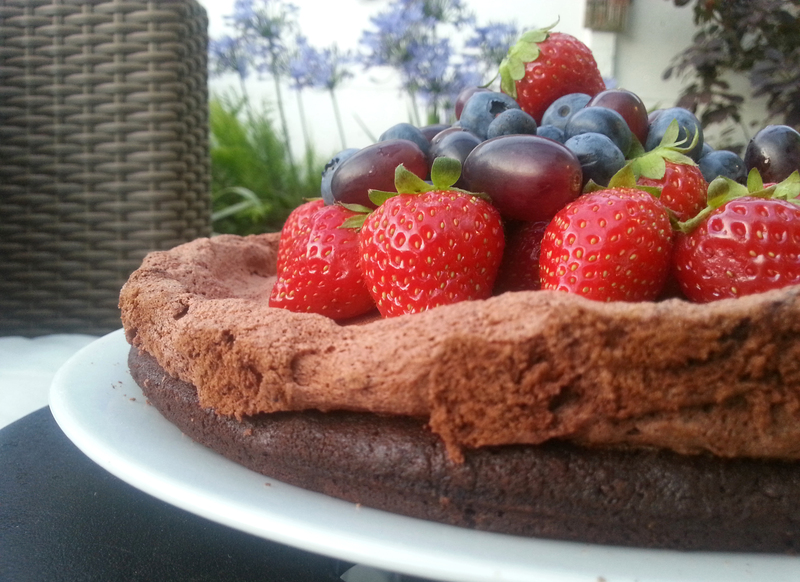 This entry was posted in Cakes and tagged baking, berries, Betty's, blueberries, brownie, chocolate, chocolate cake, dark chocolate, dessert, grapes, meringue, Meringue Cake, recipe, strawberries. Bookmark the permalink.